Serving the aviation community through world-class research, the FDDRL works to increase the capabilities of the flightdeck crew by expanding their roles and responsibilities with the use of new tools and concepts, to increase airspace capacity and safety. The Flight Deck Display Research Lab hosted a "Single-Pilot Operations Technical Interchange Meeting on April 10-12, 2012. This NASA-sponsored technical interchange meeting focused on exploring the challenges, feasibility, and practicality of single pilot operations. The goal of DAG-TM is to propose a prototype of an air/ground system with a human-centered approach. By providing the flight crew with a display that integrates information about weather hazards in the airspace, they may be able to fly as safely and efficiently in inclement weather. 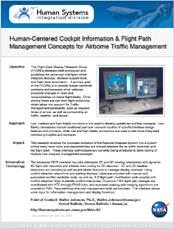 This joint Cal State University Long Beach - NASA Ames simulation project is a plan to demonstrate the feasibility of a laboratory for proving out the problems of remotely operated aircraft (ROA) access in commercial airspace, emphasizing air traffic control and pilot operations. TOOWiLDx is a Next Generation Air Transportation System simulation of trajectory-oriented operations during en route and arrival phases of flight. The Flight Deck Display Research Laboratory (FDDRL) supports the research and development of airside displays and interfaces. To that end, researchers and developers collaborate to prototype and vet concepts. Experiments are designed to focus on particular issues of interest and are appropriately scaled in scope. The research concepts are refined and matured iteratively between development and experimentation. The lab's principal product is the Cockpit Situation Display (CSD). The CSD, designed around the lab's advanced Cockpit Display of Traffic Information (CDTI), was originally built for, and incorporated into, the 2004 Distributed Air-Ground Traffic Management (DAG-TM) simulations. In that project it served as the primary visual interface for both medium-fidelity single and multi-pilot simulators. It also served as the primary visual interface for the high-fidelity full-mission Advanced Concepts Flight Simulator at the Ames Crew Vehicle System Research Facility. Since its inception, many of the lab's part-task experiments have examined, or leveraged, CSD technologies. CSD stations have been deployed at several institutions throughout the country where they have been used collaboratively with the FDDRL to study significant human-in-the-loop (HITL) issues.